RFID4U introduces innovative RFID kickstart bundle to catalyze deployments. The package has both hardware and software components for ease of use & simplicity. CONCORD, CA, USA, March 19, 2019 — RFID4U, a global Radio Frequency Identification (RFID) solutions provider, today announced that it has released a new kickstart bundle enabling businesses to quickly get their RFID initiative off the ground. 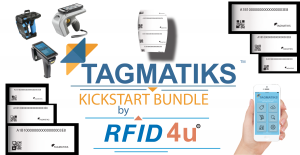 The bundle, called the TagMatiks Kickstart Bundle, is available on RFID4U’s online store, RFID4UStore.com. TagMatiks is RFID4U’s enterprise RFID platform. • TagMatiks Asset Tracking (AT) – An enterprise cloud, RFID driven, asset tracking and management software. The solution includes the ability to use both fixed and handheld RFID readers for data collection, provides asset check-in/checkout modules as well as advanced analytics & reporting features. • TagMatiks Uniform Tracking (UT) – Provides the ability to manage uniforms, garments and linens with RFID. The solution includes modules to inventory, transfer and issue/ return items. As with other TagMatiks business application, TagMatiks UT also includes extensive reporting and dashboards. Additional use case specific RFID tags can also be added to the TagMatiks Kickstart Bundle. These include RFID labels in various sizes, RFID tags designed to be attached to metal assets and specialty tags including those that can be attached to garments and go through laundry cycles. RFID4U is a global provider of RFID, AIDC and mobility solutions. As part of the company’s offerings, it provides customers solutions leveraging its RFID platform, TagMatiks across verticals including Healthcare, Manufacturing, Oil & Gas, as well as Supply Chain and Logistics. Established in 1999, RFID4U is the world’s most prominent RFID training firm and also provides RFID solutions through its eCommerce front, RFID4UStore.com.